Thomas Alfred, his wife Margaret (née Crosby), and their eight children embarked from the docks at Gravesend, Kent on Friday, 4 June 1853 on the Meridian for a journey to Australia that they expected to take some four months. Mary, their eldest child was fifteen years old and the youngest was Fanny, a tiny baby born on the 15 April 1853. Travel by sea in the 19th century was arduous, uncomfortable, and extremely dangerous. The travellers faced the danger of unknown seas, high winds, massive waves, disease due to confined and unhygienic conditions and wearisome days at sea. The reasons for Thomas and Margaret to undertake this journey must have been compelling. Although no doubt aware of the possible dangers that could be encountered during the voyage, they must have been reasonably optimistic in their expectations. Emigrants queuing for berths on a ship leaving from Gravesend (London Illustrated News, 1887). The Meridian sailed with eighty-four passengers, fifty-eight of whom were in steerage. . There were 26 men, seventeen women and the remaining forty-one passengers were children under the age of sixteen. 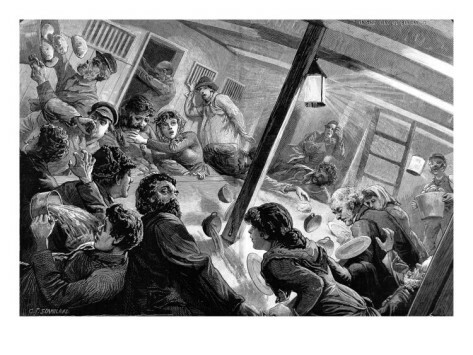 This old engraving shows what the Hendersons would have experienced as emigrant passengers being allocated berth numbers at the beginning of their voyage to Australia. They would undoubtedly have shared many of the same feelings shown. Some were buoyant with hope and enjoyed the anticipation of a new and better life of plenty. Others were downcast and sorrowful; some were weeping bitterly at the thought of leaving their home and loved ones. Gradually the passengers would make their way as well as they could, towards the open hatchway, stepping over piles of packages and through parties of miserable leave-takers, going down the ladder into the huge belly of the ship to inspect their accommodation for the long voyage. There is evidence that the ship was undercrewed. Alfred Lutwyche, in his narrative of the voyage, writes that the crew numbered twenty-three, but that some of them were not trained as seaman and that their duties included cooking and looking after the animals which ships at that time carried (Lutwyche, Alfred. 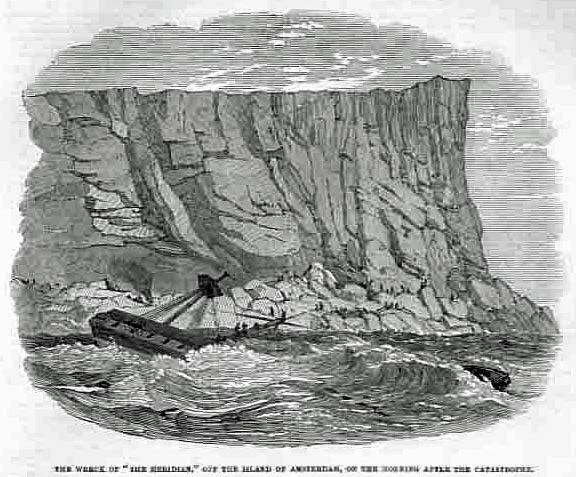 A Narrative of the Wreck of the Meridian. 1854). Mr Lutwyche gives a detailed and critical account of the problems encountered with the crew and describes how sometimes the passengers were required to help with the running of the ship. It was not only the sailors’ skills that were cause for concern. Mrs Moore in her account reported that the ship’s doctor “was a drunkard and often caused an uproar” behaving so badly that at one point he was threatened with being put in irons. 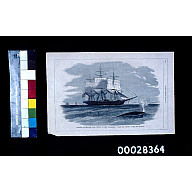 (Moore, Mrs M W. The Wreck of the Meridian undated). The Meridian was only a year old and was said to be worth about £12,000. It was one of many large passenger clippers being built at that time to meet the demand for carriage to Australia following the discovery of gold. There was a heavy premium in those days for vessels conveying mail and cargo from London to Sydney and the Meridian carried plenty of cargo estimated to be worth more than £25,000 in total, even more, when the passengers’ personal possessions were included. The vessel had a reputation for its great sailing capabilities and as a “fast sailer”. The Meridian was commanded by an able and experienced navigator, Captain Richard Hernaman, with fifteen years experience commanding similar sailing vessels including a trip to Australia the previous year commanding the Meridian. He is described glowingly in a number of accounts by passengers as having “talents and manners admirably fitted” for his position. The Captain was proud of his command and boasted that she was the “most beautiful barque that ever left the port of London” and her strength and build were thought incomparable. To prove the superiority of the Meridian the owners and the captain crowded on as much sail as possible to allow for a speedy transit. Even though the vessel did not carry a full contingent of passengers this combined with the heavy cargo made for “much discomfort on board” according to Lutchwye, who was one of the first class passengers. 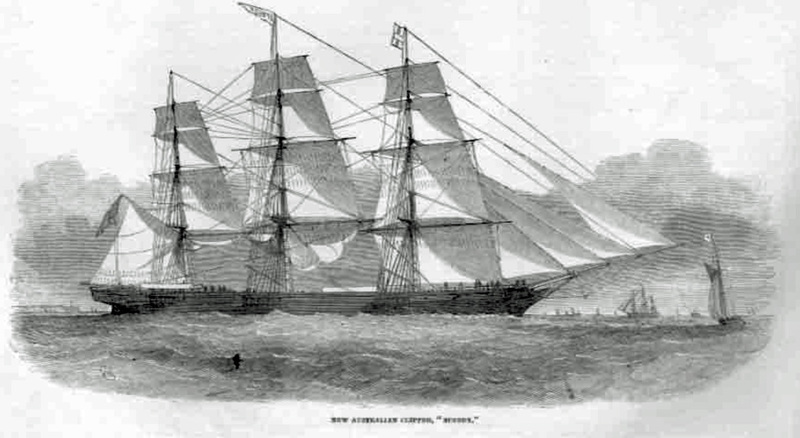 The Henderson family is described in the reports of the voyage as second cabin passengers, it is not known exactly what type of accommodation this might be, however, similar clippers built during this period describe second cabin passengers, such as the Hendersons, as sharing an enclosed small recess, about six and a half feet in width and height for the whole family (Lubbock, Basil. The Colonial Clippers. 1921. J Brown and Son. Glasgow). While that seems inadequate by today’s standards, emigrants travelling in first and second class cabins, enjoyed a far different experience to the cramped and crowded conditions in steerage. Despite the extra expense, cabin class passengers were still expected to fit out their own berths but, as a cook and a steward prepared and served their meals, no extra provisions or table and cooking utensils were required. The early part of the voyage was described by Lutchywhe as one of the “finest passages he has ever made”. With good weather and speedy sailing daily life for the passengers settled into a steady routine. When weather permitted, the passengers would usually be up on deck. Some were kept busy cleaning or cooking but as second class cabin passengers the Henderson would have had the assistance of a steward which may have allowed them a little more time for social activities, games, reading and writing or lounging on the deck. The women would be occupied with sewing and knitting or looking after the children and caring for those who were ill. Religious services were held on deck every Sunday and all were expected to attend. Documents held by the State Library of Victoria give considerable insight into the conditions that emigrants such as the Hendersons would have experienced. Even as second cabin passengers conditions would have been cramped and unhygienic with no opportunity for privacy. Many people in the nineteenth century didn’t bathe regularly and the connection between personal hygiene and disease was not well understood. Due to the cramped conditions particularly in steerage, people could not really take baths and made do with a clean-up with a damp cloth under a blanket. Most people did not have the room to change their clothing and often wore the same garments or clothing for the entire voyage. Facilities for washing clothes were very restricted. Vinegar and chloride of lime were used to wash the wooden floors and decks of the ships, as fresh water was reserved for drinking and cooking. Bedding which was usually made of straw attracted fleas and cockroaches. Bedding would be brought up in fine weather to shake out and air. The sleeping berths were disinfected as often as possible but often the cracks in the wooden slats of the bunks harboured lice, cockroaches and fleas. It was not uncommon for rats or mice to be found in the beds and bedding as well. Even in a well run ship with regular cleaning and airing of bedding the smell of soiled nappies, grubby clothes and unwashed bodies could not have been pleasant. The first few weeks were uneventful and mainly enjoyable for the passengers until the ship reached the Cape of Good Hope when the weather changed dramatically with a succession of heavy squalls and rough weather resulting in a rapid deterioration in conditions. With the bad weather came the additional discomfort of all passengers being confined below deck. On 23rd August when they reached latitude 20 degrees south, the Captain, suspecting an error in his chronometer headed for St Paul’s Island, in the far south of the Indian Ocean, where he would be able to make the necessary corrections. On the way, they encountered a strong gale, and so altered course to make for the Isle of Amsterdam, in the same longitude as St Paul’s, but 50 miles to the north. The Meridian battled a fierce storm and high seas during that night and the following day. Three of the crew, Leonard Worthington, the third mate; Charles Snow, a sailor and Edward Tulloch, the second mate, risked their own lives to rescue these passengers. Snow showed incredible bravery descending into the flooded cabin and passing the passengers up the companion ladder and along into a cuddy where all the “chief cabin” passengers were assembled. 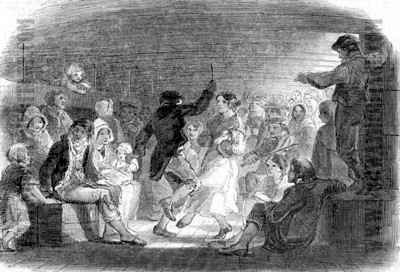 Many of the second cabin passengers were still in their nightclothes, drenched to the skin and shivering with cold. As might be imagined there was much confusion amongst the passengers. The break-up of the vessel was imminent and much of the cargo was loose and floating about. The terrified people were led in prayer by a fellow passenger and Baptist minister, the Rev Mr Voller, who was on his way to take up an appointment as Minister at the Baptist Chapel, in Bathurst Street, Sydney. With the ship disintegrating, preparations were made to abandon the vessel, which at 1.30am broke amid-ships. 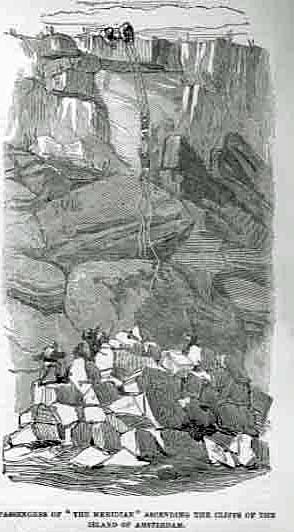 By a stroke of good fortune, the mainmast had fallen towards the shore creating a perilous bridge to rocks at the base of a sheer cliff of about 350 feet high. The Island of Amsterdam is of volcanic formation, uninhabited, and about 24 miles in circumference. The vegetation consisted of reeds and some wild cabbages. Few vessels on their way to Australia pass Amsterdam Island, as most sail two or three degrees to the south in order to catch the westerly winds. The area was no longer considered a good area for finding whales, so few whaling ships frequented the surrounding seas. ‘All our children, of whom I had eight, one of them an infant at the mother’s breasts, were naked but God in his mercy provided for us a bale of red serge shirts, part of the cargo, and which, thrown up under the ledge of rocks under the cliff, saved the poor infants from perishing the first night – colder than an English winter’s night, and the spray flying right over us. We could not have lived but for this providential supply’. Although they had searched among the wreckage little food was found except for some biscuits saturated with salt, a few tins of herrings, some salted meat and a few bottles of wine. Mrs Moore recorded that the lack of fresh water was a serious problem but “fortunately Mr Henderson had found a water keg and with others discovered water pouring down the cliffs” and as the herrings were eaten the empty tins were used as drinking cups. With the loss of the captain and his leadership, the behaviour of the sailors deteriorated. They plundered the cabins of the passengers and were generally of little help to anyone. Only a halfhearted effort was made to secure provisions from the wreck except, unfortunately, for the large stock of wine and spirits on board which was consumed by several of the crew as well as some of the passengers with inevitable results. It was not until more than twenty-four hours after the wreck that a more rigorous effort was made to secure provisions and a system of storage and distribution put in place for the little that was collected. “Mamma is this place Sydney because if it is, I don’t like Sydney”. On that same day, the afternoon of 26th August, Monsieur Rebullet and Mr Scoltock, both passengers, managed to make an ascent of the rocks at a point about a third of a mile eastward from the wreck. With help from the crew who literally ‘knew their ropes’ everyone, including the weakest, were moved to higher and safer ground. By the evening of Saturday 27th August, everyone had been hauled to the top of the cliffs. There they found a stream of fresh water and with this and the salvaged stores, including a sow which had swum ashore, there was enough food for their immediate needs. The Monmouth. 1859, English, Art work edition: Whaling Adventure – Glad Tidings to the Whalemen. Source: Trove. On Wednesday, 31 August, a small boat from the whaler appeared and signalled that the other side of the island was the only possible way of embarking. It was decided that “three of the best seamen and one of the most respected of the second cabin passengers, Mr Henderson” should make a circuit of the island to find a place where a boat could land to embark the survivors. While trying a pistol – it is not recorded who was doing this – Mr Henderson was severely wounded in the shoulder and his place was taken by the carpenter. The weather was still bad, and conditions in the encampment were very uncomfortable and despondent. The signals from the boat encouraged the bedraggled company to strike out across the island so that a rescue could be affected. The route they had to take was extraordinarily difficult, running as it did along the side of the cliff and being forced to leap chasms or detour inland if it was too wide to cross. It proved particularly arduous for those, like the Vollers, with young children: ‘I had … three children, and only two people to carry them. I had one slung to my back, and my wife had one to hers; and I asked one of the sailors, a strong able-bodied man, to carry my third for me, but he refused, saying that those who had children must carry them themselves. We had, therefore, to drag the child after us as we best could.’ As many of the survivors were ‘poorly shod’ they had a terrible time making their way over the rough terrain. It took the seamen two days, and the shoeless women and children three days to travel the 12 miles to the spot where they expected to meet the boat from the Monmouth. Thomas was extremely grateful for the help he received, he wrote: “when famine sorely tried men, and the children were spared a share of their food, although hunger keenly graved the giver. Men, who had not ties of family or blood, carried on bleeding feet strangers’ children, along the weary road you will not forget and cherished as best they could, their infant charge at night time on the naked rock”. The rescue ship was an American whaler, the Monmouth, in the charge of Captain Ludlow. Not only did he know the deserted island but he was determined to rescue everyone who was stranded there – at a considerable financial sacrifice to himself and to his crew since he would be suspending normal operations at the height of the whaling season. The Captain sailed the Monmouth to the other side of the island and managed to land one of the crew, W Smith, with directions to lead the survivors to the only landing place on the island and to assure them that the Monmouth would “on the first chance, take us off”. It was not until some days after the survivors commenced their trek before he would reach them and be able to provide some encouragement to continue. The survivors slowly struggled on with little food or water through the difficult terrain. When they reached the other side of the island there was no sign of the Monmouth as she had once again been blown out to sea. However, to their relief, they discovered cabbages growing which were eagerly devoured’. Of serious concern was the lack of water and as there was no spring, ‘for the past day we had drunk what was in reality, mud to relieve the unquenchable thirst’ (Voller). Conditions had become desperate and there was a rumour that some sailors had said the next ‘business would be to cast lots’. This distressed the mothers who were horrified as they knew ‘the children would be the first to be sacrificed’. Mrs Moore told of how Mrs Henderson begged her to hide her three year old daughter, Carrie, under her as she laid down under the shelter of some trees as evening approached. The Captain quickly distributed the food he had brought with him, and then led the relieved people about a quarter of a mile away to where his ship was anchored. Four whaleboats transferred the passengers to the Monmouth, however, it was not until Friday 9th September that all of the survivors were rescued from the island and the weather allowed the ship to set sail for the island of Mauritius, that being the nearest suitable port. The ship’s supplies of biscuit, salt beef, pork, rice, yams, sweet potatoes, and molasses were supplied to the survivors ‘without stint’. This was supplemented by fish and porpoise and it was not long before they ‘gained flesh’ and the children became as ‘noisy and troublesome as ever’ (Lutchywe). The Captain also did all in his means to make them comfortable, giving his cabin over for the use of the women and setting up a screened area for the women to be able to attend to their toilet. A watercolour illustration of the harbour, Mauritius in 1852. Painting by John Vine Hall of the SS Calcutta, National Maritime Museum, Greenwich, London. On Monday 26th September, the Monmouth anchored at Port Louis, the capital of Mauritius. There were some misgivings about the reception they would receive on their arrival however these proved to be ungrounded. In Port Louis, the Office of the Colonial Secretary ensured that every effort was made to look after the survivors, most of whom were housed in the lazarette (quarantine station). The residents were ‘warm hearted, cordial, hospitable and generous’ towards the survivors. Clothes were collected and distributed. Some took charge of whole families, providing them with accommodation and meeting all other needs from their own pockets. Subscription lists were opened by the Chamber of Commerce, and Masonic Lodges and numerous private individuals donated funds totalling £1,300. Mrs Moore, in her account of their voyage to Australia, tells in a very colourful way the manner in which the passengers were cared for in Mauritius, as well as describing the sights and people of the island. Alfred Lutwyche notes that the Chamber of Commerce subscribed £130 for a service of plate for the Captain, but he preferred to take the gift as money for his children. Nevertheless, as evidence of their appreciation, the passengers scraped together £27 to buy him a watch with an inscription recording their gratitude, and made arrangements for this to be given to him in New York. Subsequently donations were increased and on 18th February and 26th August 1854, The Illustrated Sydney News reported that gold and silver medals made in Sydney by Mr W H Ellis were to be presented to Captain Ludlow and other members of his crew and through the “office of the American Consul transmitted to their destination”. On 10th November 1853, the majority of the passengers boarded the Emma Colvin, bound for Port Phillip, arriving there on 23rd December 1853. The Henderson family are listed in the Sydney Morning Herald as passengers on the ship Harbinger, from Melbourne, reaching Sydney on 30th December 1853, and finally able to commence their new life. The voyage was obviously something the family never forgot. The trip must have been terrifying for them and they must have wondered why they ever left England. They remained forever grateful to their deliverer, Captain Ludlow, and in his memory, a house they owned at 21 Albert Street, (now Philip) Burwood was named Monmouth. Perhaps the remarkable aspect of the shipwreck is not that it happened, but that the passengers lived to tell the tale.